One cannot design a house in a completely closed process, without looking closely to what is successful or not around the world. The team has a lot to learn by simply keeping eyes opened and observing its immediate surroundings. FOLD obviously constitutes an adequate starting point for the new edition of Solar Decathlon, but the team also takes advantage of several challenging projects that are developed in Denmark and elsewhere in the world. 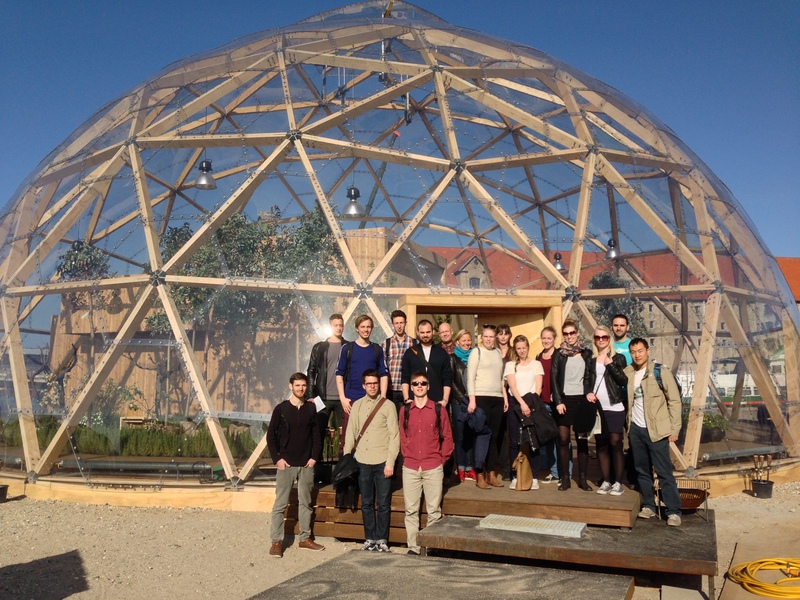 In the past weeks, not to mention the conference about sustainable buildings in Munich, Team DTU has visited the Dome of Visions, an innovative house built under a transparent dome in the central part of Copenhagen, along the main canal. Another tour was organized to visit Nordhavnen, the north harbor district of Copenhagen, which is a possible implantation site for the new house. The concept of the Dome of Visions consists of a house in which the building envelope has been splitted in two parts, creating in between a new kind of inner space, neither public nor completely private. The transparent dome provides a warmer climate thanks to the greenhouse effect, which consequently enables to decrease the amount of insulation in the real envelope of the house. Furthermore, the “inner garden” decentralizes a bit the gravity centre of the inhabitants’ life to the outside, opening it up towards the city: as the climate is milder under the dome, the users can make the most of this space during the major part of the year even in Copenhagen’s cold months. The concept of the double skin house appeared very interesting to the team. The solution proves to be relatively simple, but it contains in itself a wonderful architectural story that goes beyond just a splitted building envelope. This house probably doesn’t contain as many advanced technologies than any Solar Decathlon house, but it is somehow refreshing for us engineers to hear this kind of simpler concepts, that often show themselves as the best ones. Nordhavnen literally means the northern harbor, and the district still deserves this denomination since today, it remains mainly an industrial and port area. But the city of Copenhagen is now developing a very ambitious plan for this area. The team members were guided through this district by Rita Justesen, who is the Chief of Architecture and Planning, City and Harbour in Copenhagen Kommune. She presented the small-scale model of what the harbor will look like in about thirty years: the remaining old residential buildings will be kept, and many more will be built, starting from the closest part of Copenhagen towards the sea. The three abandoned silos present on the site will be renovated as office buildings. The urban development plan integrates of course an ambitious transportation scheme, with an extension of two metro stations in Nordhavnen, in order to provide a “less-than-5-minutes” access to public transport for each inhabitant of the city. Another evidence of the high ambition and expectations introduced in this project relates to the building regulation: the construction of new buildings is currently regulated by the BR2010 (Building Code for 2010), but the municipality wishes to anticipate and make the new buildings already comply with the standards for 2020. Nordhavnen was chosen as a possible site to implement the new house designed by Team DTU. This district appears relevant in that purpose for multiple reasons: it is situated close to the dense area of urban Copenhagen, it enhances an almost industrial wasteland, it is included in a coastal zone… More and more, the industrial sites close to cities are reused for residential or commercial purpose, and the world’s population is globally spreading along the shores, that is why the context of Nordhavnen presents a significative urban example to study. All content is © 2019 by DTU Solar Decathlon Europe 2014. All rights reserved.